SortCL is the powerful data manipulation program and popular user interface driving almost every IRI software product. Short for Sort Control Language, SortCL is an award-winning fourth generation language (4GL), standalone executable, and callable library routine for managing structured and semi-structured data. 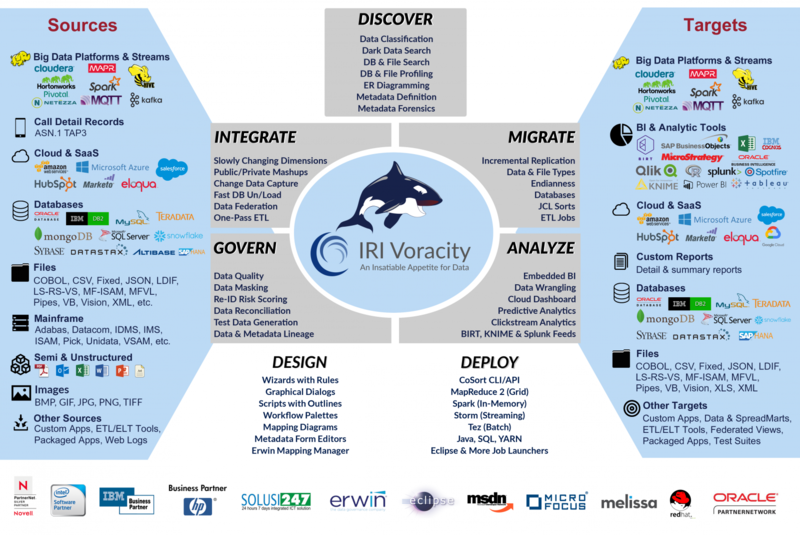 IRI Voracity, which includes all of the above, supporting and combining multiple data discovery, integration, migration, governance, and analytic use cases. The Hadoop-enabled edition of Voracity can also run several SortCL programs interchangeably in MapReduce 2, Spark, Spark Stream, Storm, and Tez. SortCL is therefore what makes CoSort and Voracity a one-stop, one-I/O "super tool" for data transformation, conversion, cleansing, mapping, and reporting. 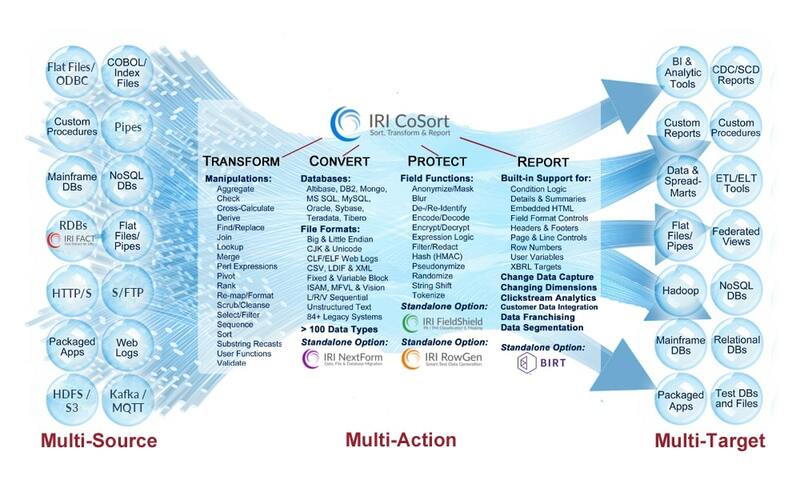 SortCL's extensive data manipulation and movement capabilities -- detailed in the tabs above, and listed in this diagram under the CoSort logo -- can be combined in a single job and pass through huge volumes of data. SortCL uses an open, explicit metadata to define, manipulate and reformat their data in more than 150 disparate file and database sources. SortCL syntax is self-documenting; anyone can read, recognize, and modify SortCL programs with ease. SortCL uses simple English statements based originally on VMS sort parms and now also familiar SQL, C, and Perl expressions. Unlike cryptic ETL, 3GL, and MapReduce programs, no training is needed to understand what a SortCL script will do. But for those who cannot or simply will not learn another language, there's a powerful GUI to save them from it. IRI Workbench is a graphical integrated development environment (IDE), built on Eclipse,™ for creating, running, sharing, and modifying SortCL jobs, and their "data definition file (DDF)" source and target layouts. SortCL job scripts perform, speed, and/or combine: big data transformation, conversion, protection, and BI in the world's largest production environments. Quickly find and re-use SortCL metadata in multiple IRI products and projects to meet your data processing, protection, presentation, and prototyping requirements. Use SortCL job scripts and DDF layouts across the IRI ecosystem, and manage their use and lineage directly in Eclipse or available cloud repositories like Git, CVS, and SVN. SortCL DDF is also compatible with the Erwin (ex-AnalytiX DS) Mapping Manager, and the Meta Integration Model Bridge (MIMB) from Meta Integration Technology, Inc. Convert the metadata already used in your BI, CRM, database, ETL, and modeling tools, into the metadata used in all IRI software. This preserves your investment in existing metadata, and allows you to more quickly leverage the benefits of IRI software running with (or instead of) those applications.